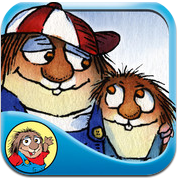 Just Me and My Little Brother – Little Critter is another hit from Oceanhouse Media! They have released it with a special discount price and it is a treasure. This is a fantastic tool to help open a dialogue on a common life process that kids deal with. When there is an addition to the family there is so much excitement! There is also the reality that everything happens in its own time – a valuable lesson for our kids. Little Critter is excited about all the fun things he can do with his little brother! From trick-or-treating on Halloween, to riding bikes, building a snowman, and more. He is ready to have these exciting experiences with his brother, but brother must first learn how to walk. Find and tap along the way for a surprise score at the end! Scroll to Your Favorite Pages!